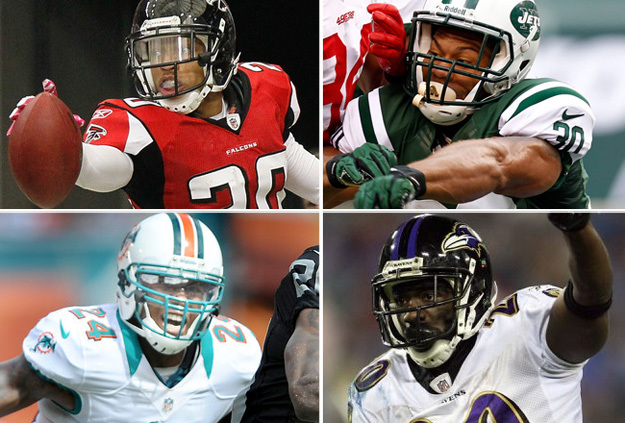 Free Agent Veteran DBs are plentiful this year. Here is my quick list of potential Eagles targets via Free Agency. Many of these available free agents have either injury, off-the-field, or on-the-field concerns. They wouldn’t be free agents if they were flawless. If these players could return to form in a season or two they would be well worth the investment. You never know if you don’t try, a one year deal may be just what the doctor ordered. If the Eagles are looking to rebuild their entire secondary, they could easily find four starters via free agency that are better than the crap they put on the field last season. I would be okay with acquiring two starters via free agency and two from the draft, but whoever the Eagles want to put on the field better be starting caliber or knocking on the door of that caliber. There is no reason the Eagles can’t find at least decent talent in the secondary before next season. When healthy Brent Grimes is a very good cornerback, unfortunately he is coming of an ACL injury. With the Falcons also losing Dunta Robinson, Brent Grimes would likely be in high demand in Atlanta. If he can sneak out of Atlanta he is well worth a look in Philadelphia. Chris Gamble is also coming off an ACL injury. It is just really unfortunate because no player is more in need of a strong ACL than an NFL cornerback, constantly changing directions. If the Eagles feel the injury won’t hinder him going forward Gamble also deserves a look. Aqib Talib is a very capable corner, but his off the field concerns are a concern. The Eagles tend to avoid players like that, but the coming of Chip Kelly may change that. Kelly craves talent, and great talent is always in short supply. Sean Smith is the only corner that has been directly linked to the Eagles through multiple reports. He is very tall and athletic cornerback, but he has become known as a liability in coverage. Kelly treasures height in his players. You can’t train a player to be tall, if Kelly feels he can get anything out of him, he is worth it at the right price. Dashon Goldson is everybody’s favorite available safety and will most likely go to a bad team for too much money and will fall into obscurity for a decent paycheck he really doesn’t need to earn. Assuming Howie Roseman could swoop in and convince him otherwise, he would be a very solid signing for the Eagles. Glover Quin is only 27 years old and is a very capable up and coming safety who is right in the prime of his career. Quin is the most realistic safety option for the Eagles. Laron Landry is now considered a safe signing after formally being considered injury-prone, Landry completed a 16 game season and wasn’t completely terrible during those 16 games either. I would be very happy if the Eagles signed Landry, who brings a very physical presence to any defensive backfield. He can be considered a liability in coverage because he is more of an in the box safety most helpful in run support. Well, if we’re going to have a player on the defense with the Kurt Coleman mindset it wouldn’t be the worst thing if he was better than Kurt Coleman. Kenny Phillips is very injury prone, not sure I like the idea of signing him, but when healthy he is an okay option at safety. I also like the idea of signing someone like Ed Reed for one to two year deal to bring new leadership to the defense, if for no other reason than to show young guys how to play and bring a little play making ability with him. ← Eagle Rumor Mill – Darrelle Revis in Midnight Green?